Here is where I show you some kool science projects for kids to include in their craft sessions. We have added them because you can create models from paper or other easy to find materials around the home. We have projects using wind, illusion, light, colour, and motion. So to begin with lets start with motion, wind, and illusion. The zoetrope was used in the Victorian era. It works by spinning either manually by hand or with a crank, or by an electric motor. We also show you how to make the paper plate turbine which gives you an opportunity to play with the wind, one of my favorite pastimes. It is totally wind powered. But there is also fun in projects that require you to keep very still. Experimenting with a pinhole camera model is a very rewarding science craft when you see how images are captured. The Zoetrope is Victorian toy that many children will have seen in the museum of moving pictures and also tried their hand at making in school. It is facinating to play with and inspires the player to make lots of strips to spin and enjoy more moving pictures. Find out why the pictures seem like they are moving when they are not. The age group for this science craft is from 8 to 14+. 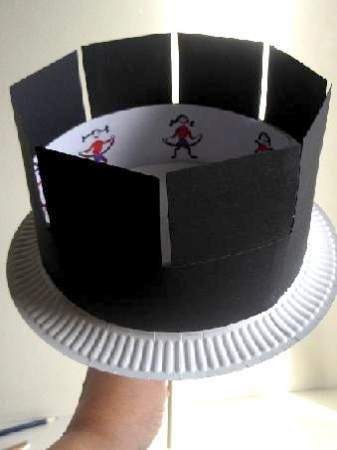 There is an easy way to make a sequence of images on a zoetrope strip. But you need to make them in such a way that they really show up clear when you spin the zoetrope. This craft will teach you balance and aerodynamics. 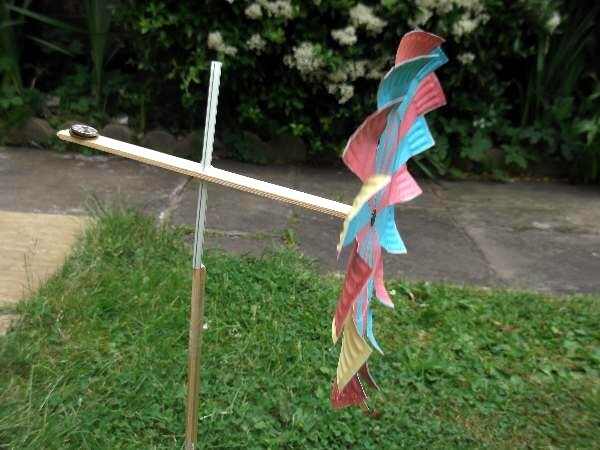 This paper plate wind turbine not only spins its rotary blades but it also spins on its straw axle. "Say Cheese!" 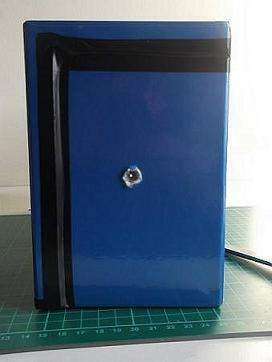 This is a pinhole box camera model that you can use to understand how images are captured by a real camera. It doesn`t take a lot of materials to make and you can experiment to see how distance, light and even the size of the hole has on the quality and sharpness of the image.